Identities can potentially serve as powerful elements that both drive, and are shaped by, entrepreneurial actions. Entrepreneurial identity is a complex construct with multidisciplinary roots, and therefore there is scope to more fully enrich our theoretical understanding of identity and identity formation, at both individual and organizational levels, and their relationship to entrepreneurial processes, practices and activities. This book highlights two key features of contemporary research on entrepreneurial identity. First, to see it as a dynamic rather than a (relatively) fixed and unchanging feature, shaped by different life episodes. It is increasingly fluid, multilevel and multidimensional, comprising multiple subidentities rather than a univocal (and unchanging) self. As such, it has a profound effect not only on the way we feel, think and behave, but also on what we aim to achieve. Accordingly, it is vital that its dynamics are better understood, particularly in determining how actors behave in an entrepreneurial context. 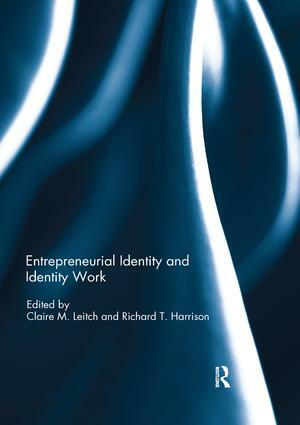 The book’s second focus is on identity work as the process through which entrepreneurial identities are formed and shaped, and the contributors demonstrate how the dynamics of identity formation relate to entrepreneurial outcomes in a range of individual and organizational contexts. This book was originally published as a special issue of Entrepreneurship & Regional Development. Claire M. Leitch is Professor of Entrepreneurial Leadership and Head of the Department of Leadership and Management at Lancaster University Management School, UK. She is Editor of International Small Business Journal. Richard T. Harrison is Professor of Entrepreneurship and Innovation, and Co-Director of the Centre for Strategic Leadership, at the University of Edinburgh Business School, UK. He is founding co-editor of Venture Capital: An International Journal of Entrepreneurial Finance.